This bullion cavalry hat device could be a centerpiece and would look fantastic in a display (source: Mosby & Co Auctions). For me, collecting militaria has been an adventure of discovery as I learn about who my ancestors were and what they did to contribute to the freedoms we enjoy in the United States today. As I’ve stated in earlier posts, my research began with the receipt of a handful of militaria pieces and documents for two of my relatives who served in the armed forces. Rather than simply store the items in a drawer or closet, I wanted to assemble and display them in such a manner as to succinctly describe their service. Seeking to be as complete as possible, I sent for the service records for both relatives so that I could fill in the gaps if there were any missing decorations from what I already possessed. Upon receipt of the records from the National Archives, I noted that there were, in fact, several awards that had never been issued to either veteran (many service members were discharged at the war’s end war, prior to the decorations being created and subsequently awarded) and promptly obtained the missing pieces. “I” Company of the famed Rush’s Lancers. Photos like these go a long way to help collectors seek the correct items for accurate displays. This photo was taken by Matthew Brady. In preparation for assembling the displays, I was motivated to learn all that I could about others in my family who served. As I worked on my family tree, I began to discover that there were veterans at each successive prior generation who served. From Vietnam to the Korean War, World War II to the Great War, from the Civil War, the war of 1812 and finally, the American Revolution, I had ancestors who were participants. At the prompting of my kids’ inquiries as to who these people were and what they did, I embarked on a mission to assemble tangible representations of some of the notable veterans in the family lineage – including uniform items, awards and decorations. This is a close-up of the soldiers of “I” Company, 6th Pennsylvania Cavalry. This photo was taken by Matthew Brady and clearly shows the weapon that gave the regiment its name. Limited by financial resources and storage space, I needed to choose the people from our past that would garner my collecting attention. This decision has caused me to abstain from purchasing some of the items that I found very interesting but couldn’t justify acquiring (after all, I am not creating a museum in my home). One of my recent discoveries is that veteran in my lineage served in a storied regiment during the American Civil War. 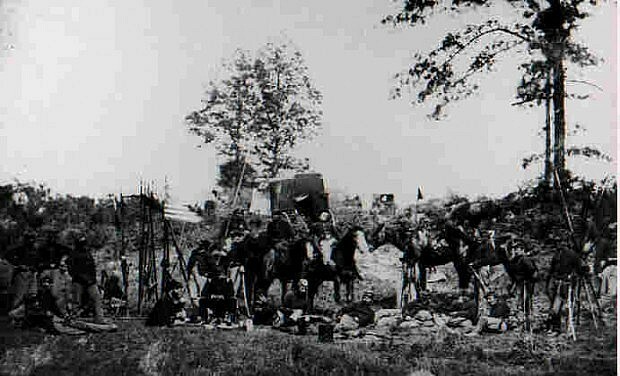 This unit, the 6th Pennsylvania Cavalry, was the only mounted regiment to be equipped with the lance as their primary weapon, prompting the nickname of Rush’s Lancers (Lt. Colonel Richard Rush was the unit’s first commanding officer). While my ancestor wasn’t a distinguished veteran or officer (he was a corporal), he did serve throughout most of the war, participating in many of the bloodiest battles. Well out of my budget, this Lance (that was carried by a member of Rankin’s Michigan Lancers) during the Civil War, sold at auction for $1,440.00 a few years ago (Source: Cowan’s Auctions). I have been pondering how I could create a tasteful, yet small assembly of items that would provide an authentic and visually appealing display. What sort of items are available (and that I could afford) that would fit into a smaller shadow box and tell a story of my great, great, great grandfather’s service? This .44-caliber slug could provide a measure of authenticity in my display as the revolver was carried by the troops or the 6th Penna. Cav. If this were dug from one of the Lancer’s battlefield sites, it would only make the display that much more personal (Source: Civil War Outpost). After shedding the lances, the 6th Penna Cavalry switched to the more traditional weapons. This .52 caliber Sharps carbine round would be appropriate for my display (source: Greg’s Relics). While this cavalry button (as distinguished by the “C” on the eagle’s shield) may be accurate for a cavalryman, it isn’t appropriate for my ancestor’s display as he was a corporal. I am still researching the proper buttons for display to confirm my suspicions, but I may be faced with purchasing the extremely rare Pennsylvania-specific buttons – as Rush’s Lancers were not a mainline Union Army regiment. Taking into account that my relative was a member of the Union Army, I could pursue pieces of the Union uniform such as buttons or other devices. I would need to focus on cavalry as their buttons are different from those of the infantry. If I was fortunate enough to locate one at a reasonable price, I could obtain the kepi hat device. Including excavated items such as ammunition rounds for weapons carried by cavalry (such as .52- or .56-caliber carbine or .36- or .44-caliber revolver rounds) that were found on one of the unit’s battlefields would be a terrific accent to the display. Ideally, I’d like to get my hands on the blade from a lance, but with the lofty price (one was sold at auction in 2005 for $1,440.00) they command, I will have to abstain. 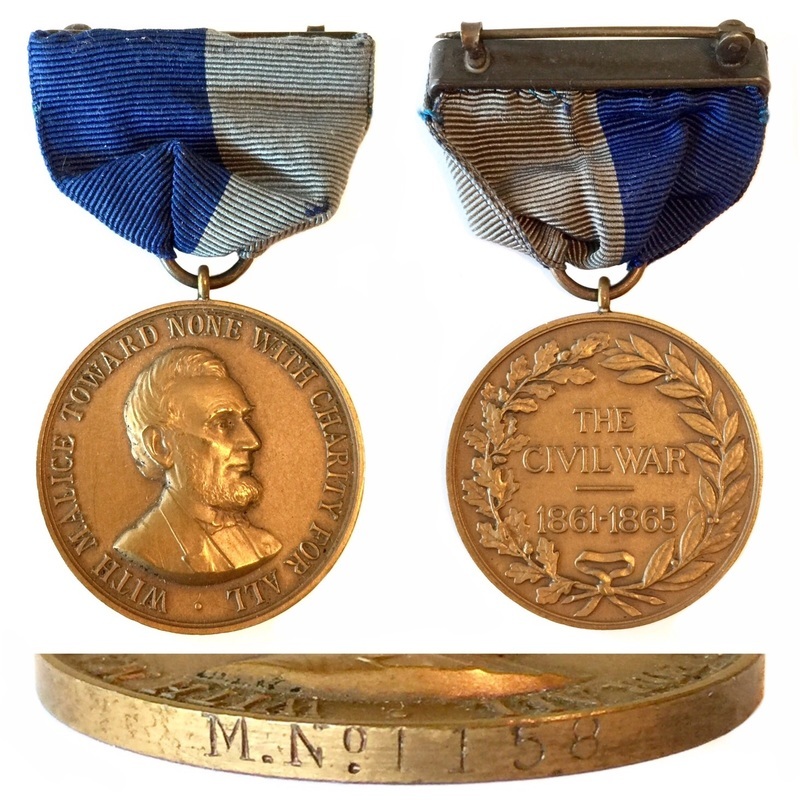 If I can locate a period-correct Civil War medal, it would be icing on the cake. No matter the direction that I ultimately decide to take, I know that I will be spending the next several months scouring the online dealers and auction sites to acquire the pieces. In the meantime, I await my great, great great grandfather’s service records so that I can (hopefully) nail down his service and create an accurate display. The national encampment medal’s brooch reflects the date and location of the 1905 Reading, PA gathering with the GAR seal prominently displayed in the center (source: eBay image). Researching a person’s history who has been deceased for 107 years is difficult at best. Delving into the military service of a person who is an American Civil War veteran, while challenging, is a few percentage points easier, provided you understand the discoverable information. Where things become a test of one’s patience is the task of using the discoveries to create and encapsulate that person’s service with an artifact display – a shadow box to provide an aesthetic visual representation. I’ve assembled three shadow boxes (and contributed to a fourth) that detail the service of my veteran relatives, incorporating pieces that were handed down to me and augmenting them with replacement items that were once lost to time. One of the boxes I created included my own medals, ribbons and assorted pieces from my decade of naval service. All three of the collections I created currently hang on display in my home office to tell a story for my family and guests about the years of service proudly given to our nation. I managed to source a GAR membership medal for inclusion in the shadow box. This example shows the obverse and reverse of a GAR medal from 1886 (source: OMSA database). Through my continuous research into my family’s heritage and genealogy, I’ve uncovered details regarding ancestors who wore our nation’s uniform dating all the way back to the War for Independence. In the last few months, I zeroed in on the Civil War, identifying several family members who volunteered to gird themselves in the blue, heavy wool of the Union army. As noted in earlier posts (Civil War Shadow Box Acquisition: “Round” One is a Win and Due Diligence – Researching My Ancestor’s Civil War Service), several details began to emerge when I focused on my great, great, great grandfather’s service in the 6th Pennsylvania Cavalry, in the 70th Pennsylvania Volunteer Regiment. Pressing into the details in the last few weeks, I learned that though my GGG grandfather was discharged in February of 1863 due to a disability he received during his service with the cavalry regiment, he again volunteered for a stint in the defense of his home state during General Robert E. Lee’s summer invasion of Pennsylvania. My ancestor responded to President Lincoln and Governor Andrew Curtin’s emergency call for temporary service (90 days) as a home guard force, serving with a light artillery company with the Department of the Susquehanna. It appeared that he was compelled to continue to fight though he’d already seen the ill effects of war at places such as Malvern Hill and Sharpsburg. This hand-tinted postcard image depicts the Dayton Soldier’s Home campus as it appeared in 1898 (source: Carolyn Johnson Burns). In the years following the war, veterans were drawn to the quiet battlefields and to their surviving comrades as the impact of the fighting and the bonds forged in combat were too strong. Soon, the former soldiers formalized their “reunions” with the founding of an organization, the Grand Army of the Republic (GAR). 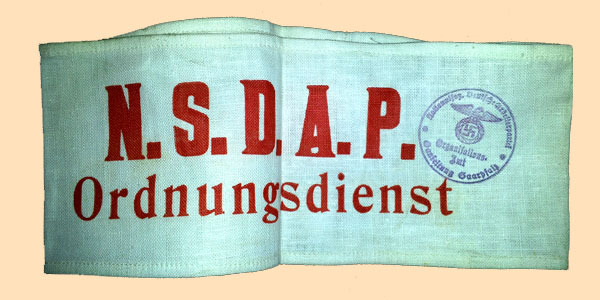 This organization would last for 90 years from its inception in 1866, advocating and lobbying for the veterans and their needs until the last veteran finally passed away in 1956. My GGG grandfather was a proud member of the GAR and would ultimately benefit from their efforts, being cared for during the last two years of his life in the soldier’s home in Dayton, Ohio. The front of the 1905 Reading, Pennsylvania GAR national encampment medal is beautifully designed, incorporating three bronze-cast elements; the brooch, suspension and pendant – all of which include specific aspects of the gathering (source: eBay image). One discovery I made was that in 1905, my 3x-grandfather made a trek from the soldier’s home to his hometown in Pennsylvania to, according to his obituary, say his goodbyes to his family as he didn’t feel that he’d survive the coming winter. Being a native of Reading, Pennsylvania and a member of the GAR, I deduced (based upon the details in the obit) that he, more than likely, used the trip to say goodbye to the men he had served with. The GAR happened to be holding a national encampment reunion in Reading and he would undoubtedly have made use of the trip for both purposes. Taking into account the new details, I decided that I would add to the growing list of display items for my shadow box project by incorporating one of the encampment medals from that 1905 Reading gathering. Searching the internet, I managed to locate one in an online auction, submitting the winning bid earlier this week. In addition to the two authentic small arms projectiles (a .52 cal Sharps carbine and a .44 cal Colt revolver round) that were found in the battlefields where my ancestor fought, and the 1905 Reading national encampment medal, I have acquired a GAR membership medal to round out the vintage artifacts that will be included in the shadow box. Heeding the advice of a fellow collector, I decided to pursue precise reproductions pieces – a crossed sabres hat device, the regiment and company number and letter devices and yellow cavalry stripes of a corporal – to round out the display. After the final pieces arrive, I will assemble the display and promptly hang it near the others as I continue to honor those in my family who served. The reverse of the 1905 encampment medal depicts the newly (at that time) dedicated William McKinley monument in Reading, PA. President McKinley, a Civil War veteran, was assassinated in 1901 (source: eBay image). The GAR seal shows a handshake between two former adversaries (source: eBay image). Like investing in the stock market, collecting is a long-term venture in which only those with considerable patience and persistence combined with a sense of timing in concert with knowledge, will succeed. Before one commits financial resources to a particular stock, the investor will have performed some manner of due diligence, researching the aspects of the company’s business plan, leadership, as well as short and long-term projections. When attempting to assemble a display, group or particular theme of militaria, a collector must research the era, unit and veteran(s) before initiating research of the proper item(s) that would be suitable for the collection. One must also be familiar with what to avoid. In the area of Civil War militaria where “insignificant” pieces such as authentic uniform buttons can reach prices near (and sometimes in excess of) $100, collectors need to be aware of the fakes and reproductions. The second Regimental flag of the 6th Pennsylvania Cavalry – the unit in which my 3x great grandfather served (source: Pennsylvania capital Preservation Committee). Recently, I posted about a commemorative display (to honor an ancestor) that I had begun to assemble. I was kicking off that project with the acquisition of a .52 caliber Sharps Carbine bullet that was discovered at the battlefield of Malvern Hill in Henrico County, Virginia. During my (previous) genealogical research, I discovered that my great, great, great grandfather had served in the 6th Pennsylvania Cavalry during the Civil War. Seeking to honor one of my direct ancestors, I decided to create a shadow box to perpetuate the memory his sacrifice and service during one of the most terrible wars in our nation’s history. Early on in my research, I discovered that my ancestor, Corporal Jarius Heilig, had been discharged prior to the end of what should have been a three-year enlistment – the same as the balance of the 6th Pennsylvania Cavalry. 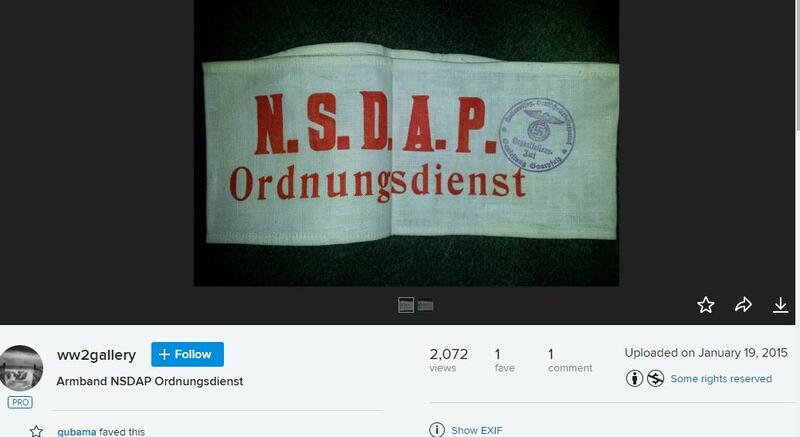 In addition, I located pension documents (from the late 19th century) that showed my 3x great grandfather had been disabled due to something that had happened to him during the war. Armed with this information, I began to question how he had been disabled. Had he been wounded by an enemy round? Did he sustain shrapnel wounds from an exploding artillery shell? Eager to clearly document his military service as well as fuel my shadow box collecting efforts, I submitted a request to the National Archives to obtain Heilig’s Civil War service records. Three weeks after submitting my request, a package was delivered to my mailbox and my excitement began to escalate. I ran into the house while tearing into the padded envelope. I rushed to my computer to insert the CD (I had the choice or paper copies or the disc) into my computer. Hoping that the documents (contained on the disc) would solve the mystery and provide me with specific details, I began to read through the scanned documents, most of which were muster sheets showing locations and dates. Thirteen pages in all, the single, most important document was the discharge certificate which described the reason for his early release from duty (February, 1863). There it was, written in beautiful penmanship, the reality of war for my ancestor, a cavalry soldier. It seems that he sustained a disabling knee injury as the result of being kicked by a horse. Unable to perform his duties, he was released to return to his family. Unfortunately for Heilig, it seems that he suffered from the injury for the rest of his life. The scan of my 3x great grandfather’s Civil War discharge document showing his service and his wound. Needless to say the discovery had been a letdown of sorts. I called my mother to relay my discovery and my disappointment to her. Surprisingly, my mother noted that there was also an absence of detail – information about the circumstances of the horse-kick incident. Had he fallen from his horse (on a cavalry charge in battle) and sustained the wound as a result of being dismounted in the fray?